The Coronado guitar is back, with greater sound, build and beauty than ever for the guitarist who appreciates a different Fender guitar with a special history. In the mid-to-late 1960s, the Coronado family was Fender's first foray into the hollow-body electric guitar world. Now the Coronado name and style returns to Fender as an utterly cool new guitar in the Modern Player family, with stunning looks, tone and features. The Fender Coronado guitar's thin semi-hollow maple body has an alder center-block and bound top and back, with stylish bound f holes. Its "C"-shaped maple neck has a 9.5"-radius white-bound rosewood fingerboard with 21 medium jumbo frets and elegant white pearloid block inlays. 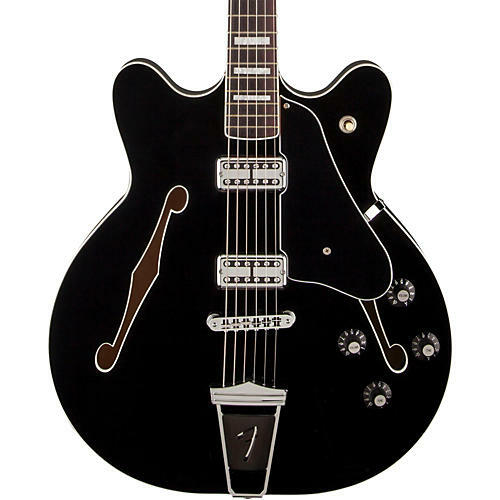 Other distinctive features include dual Fideli'Tron humbucking pickups with three-way toggle switching, three-ply black pickguard, four skirted "amp"-style control knobs (volume and tone for each pickup) and an Adjusto-Matic bridge with floating "F" trapeze tailpiece. Adjusto-Matic bridge with floating "F" trapeze tailpiece.